Blood in the water, blood in the land. Southern Gothic crossed with B-Movie, like John Farris and Flannery O’Connor wrote a script to be directed by Jim and Artie Mitchell. Lurid and mesmerizing, festooned with horrors taken for granted flowing into each other like water under the mangrove trees overhung with Spanish moss in little old New Alabama…the narrator’s camera eye does not shrink from depicting each gross and engrossing incident in this catalogue of terror. It’s just past the Civil War in the American south. Luann Lee escapes the preacher only to be “rescued” by Red, who should probably be played by Rory Calhoun if you can’t get Kurtwood Smith, in the movie, when someone like Brian Yuzna or Stuart Gordon directs it. I can just imagine Red’s face, with a furking leer on it and the blood running from his mouth. Michael Faun depicts him so expertly, draws the environment so clearly, evokes crawling horror so well, that you’ll never get the taste out of your mouth. Highly recommended. Also recommended-Drugula, by the same author. TEST PATTERNS is the name of the book. We’re collecting the money to get the thing out to the public. 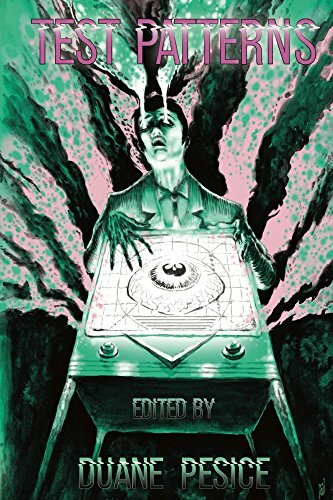 The concept; a collection of short speculative fictions written with classic television shows such as The Outer Limits, The Twilight Zone, and The Night Gallery, in mind. These will be the dreams and nightmares one finds themselves waking from after watching that eerie midnight movie, only to find themselves bathed in the gray glow of the test pattern on the TV screen. A collection richly varied stories which might impart a moral, inspire thought, offer meaning, inspire hope, or instill dread. Tales told in unique ways, employing provocative twists and surprises, and exploring the universal themes of humanity and self-discovery through the lenses of horror, fantasy, and science fiction. This will be the premier publication and flagship anthology of Planet X Publications, a new press founded in California in 2017 by Michael Adams. Author and musician Duane Pesice of Planet Moderan Press is serving as editor-in-chief of this volume, bringing in diverse talent from (literally) around the world to delight and disturb our readers with brand new tales of the weird and otherworldly. If successful, we hope to make Test Patterns an annual series, showcasing the best and brightest writers working in weird fiction today, and the emerging talents who will become household names in the years to come. The proceeds of this Go Fund Me campaign will go directly to the publication of this book by providing funds to pay our authors, cover artist, and printing costs. Those who make a contribution of $5 will receive an eBook, in the format of your choice, Mobi, ePub, or PDF, of Test Patterns when it is available. Those who make a contribution of $20 will receive a paperback copy of Test Patterns, plus an eBook version. Those who make a contribution of $40 will receive a limited edition hardcover edition of Test Patterns, plus an eBook version. Anyone seeking multiple copies or combinations of rewards, may donate the amount covering multiple rewards and email planetxpublications@gmail.com to specify reward types. We hope to fulfill rewards and publish Test Patterns by Fall 2017, in time for Halloween. This story has been unavailable for quite a while. I’m rectifying that lack. This is the original unedited version of the first Cthulhu Mythos story I wrote in nearly 20 years, as a gift for the readers on my website. There have been a couple of hundred since then, millions of words worth of tentacles and terror. The keening of a tiny off-key flute jerked Jones out of a momentary slumber. He wiped the back of his left hand across his crimson eyeballs, blinking to restore his orbs to some semblance of normal vision, and steadied his right hand on the steering wheel. How long had it been since he last slept? He had no idea. Jones had been where time does not pass in a normal fashion, where geometry was haphazard and the shadows did not fall where any self-respecting shadow would, or in colors that a regular earthly shadow would assume. His eyes had beheld hues that they were not meant to, way into the infra-red, far into the ultraviolet, and his tortured gaze could not fix on the sunlit colors of the world of his birth for very long any more. The light changed from red to green, and Jones moved on out of force of habit. His cargo continued their obnoxious piping, and he rolled down the window for a moment to catch his breath, for the stench was overwhelming, a combination of rotting vegetation, maggot-ridden meat, and putrefying sealife that he had been inhaling for far too long. His head cleared a bit, and Jones risked a glance at his visage in the rear view mirror. His tangled thatch of mud brown hair had assumed a life of its own, wild and unruly without a hint of order, and much, much longer than it had been the night before. His eyes had taken on the sheen of ‘Bama’s uniform shirts, the pupils dilated so far that only a hint of the verdant irises remained. Mucus ran from his nostrils over his lips, which were the color of the rotting dead fish his cargo smelled of, and ran down his chin to ooze down his begrimed shirt front. His skull began resonating as his cargo began to add the sound of drums to the loathsome piping, and the friendly colors of the holiday lights strung up along both sides of the boulevard began to take on a menacing aspect as the cargo began to ululate along with the sounds. Too late, he looked away from the mirror, for he glimpsed the flesh of his cargo, glowing the faint green of swamp gas, there in the back of the van. He accelerated slightly, switching lanes to pass an ancient Saab turbo, and wished he’d never signed on, that fateful night two weeks ago. It was not the last time he’d have that particular wish. A fortnight ago, Jones had been online, reading his day’s mail, when an instant message appeared on his screen. Jones thought it a standard cybersex paysite come-on, and moused over to x it out of existence, like so many seamy ads he’d seen before, but was instead moved to answer. “What if I’ve never been happy?” He queried. “How would I recognize what you’re offering?” He thought this would drive the annoyance away. Wow, thought Jones. This isn’t exactly what I expected-it’s more like a demented Jehovah’s Witness than a come-on. “How come he has no name?” He typed. “I will not click on an anonymous url, based on what you’ve been saying. I’ve heard all this stuff before, in more attractive terms than you’ve used, and that didn’t sway me. Jones rubbed his chin thoughfully, feeling the new growth there. “Is that all? I thought you had something original to offer.” And he moused off the screen, going back to Christmas shopping. The black package arrived with a few other packages, so Jones didn’t notice it at first. It sat in the front hallway with the other gifts, until the weekend, when Jones could distribute the booty. Meanwhile, more kept arriving, big packages and little packages, filling the foyer and spilling over into the kitchen at first, then oozing over into the front room on the other side. It was at this point that Jones began to notice something was amiss amid the disorder. “There’s no way,” he declaimed to the air. “No way I bought all this stuff, unless somehow I won the lottery. I remember ordering a lot of books and games, but mostly from one place. And what’s that smell?” For indeed a ripe little stench had begun to emanate from the pile. It was hard to place, but very definitely there. Sort of a musty, fishy odor, Jones thought. Or carrion…maybe a mouse had died or something. He paid no attention to it, or tried not to. Eventually the sheer magnitude of the offensive smell caused him to seek out the source, in order to remove it. Jones pawed through the stacks and stacks of packages until he found one that was riper than the others. It had a wrapping the color of dead seaweed, with a bow that resembled limp spaghetti, like a string tie made of more seaweed. Jones rummaged around in the cabinet under the kitchen sink, coming up with a can of lysol and two economy size refills. The refills he tucked into his belt, the spray can he set on the shelf just inside the back door. He took the package in his hands, and it was soft, and mushy, repellent in the extreme, and he threw the package into the dumpster in back of the garage, emptying the two refills into the dumpster. Since he’d already been handling them, he made up his mind to sort out the various gifts. He strolled back into the house, sniffling, testing the air. The house was redolent of old cigarette smoke, and some spilled lysol, and last night’s chili, but no vague unidentifiable dead fish like aroma was in evidence. He sprayed about half of the can of lysol into the air, washed his hands to get rid of the last of the curious odor, and set to the task. The packages he remembered actually ordering during his late-night giftathon he set aside, on the kitchen table. That left quite a few items. Jones examined each for any sign of the sender, establishing that some were from friends, and some were premiums from the companies he had ordered gifts from. The wrappings weren’t cheap, or gaudy, or clashing, and the only one that really stood out was the black one with the blood-red ribbon. Jones wondered aloud, briefly, about the parentage and mental stability of anyone who would send packages wrapped in black paper for Christmas, but he did have some friends who just might send something like that as a practical joke. He mulled opening the package, and finally placed it in the kitchen with the identified gifts, to be opened later. Those packages turned out to be full of gizmos and whatsits, which he placed on his desk, examining them from a distance as if they might bite. Christmas was two weeks away. Jones hummed Christmas tunes under his breath while throwing away all of the wrapping paper and tiny boxes that the things had come in. Jones played with the gadgets that came from the unidentified gifts, miniature puzzles that linked in odd ways, strange little magic tricks that made things disappear and reappear, and a collection of tiny figurines, carved from a kind of waxy greenish-gray stone that he wasn’t familiar with. The figurines were unique enough that he elected to keep them rather than auction off or otherwise try to sell them. Plus the workmanship was really excellent, every detail standing out in relief. One of the figures was an octopus-headed, clawed and bat-winged, stout manlike figure (otherwise), with a mass of tentacles or feelers about the mouth, which was gaping open menacingly. Another was not of stone, but of a jellylike material, which changed shape on its own periodically, and glowed in the dark. The colors of this thing changed at random. There were twenty or so even smaller pieces, somewhat like the jelly sculpture, but of harder substance. The surface of these gave a little bit, but didn’t continually morph like the jelly figure. These were colored the exact shade of the glow-in-the-dark monster models his father had given him, a particularly memorable shade of whitish-green. The models were up in a box in the attic somewhere, out of mind, but that particular color was unforgettable. Jones thought these to be acolytes of the jelly guy, as he called the figure. Acolytes seemed right, somehow, so he stuck with it. The other pieces were equally deranged, anthropoid (sometimes) and mixed with plenty of other animals, or completely alien, with no identifiable bestial or vegetable characteristics at all. The larger ones had oddly-angled bases, carved with symbols or letters in a language Jones had never seen before. The characters looked a little like crop circles, Jones thought, but not entirely. Jones pushed these things around the surface of his desk idly, daydreaming about the good food at Christmas dinner, and the smiles on the faces of those he’d bought gifts for. Images began to form at the back of his mind, scratching at the surface of his consciousness like rats in the walls of his cranium. His dreaming began to take the shape of a nightmare as gigantic blocks of stone appeared out of a green sea, hordes of the malleable small creatures clambering about on the rock as great washes of foul seawater washed over them. The angles of the stones were somehow wrong, and they were much too large to have been quarried anywhere nearby, and they appeared to have been carved out of the same sort of stone as the squid man. Jones stirred, his eyelids fluttered, and another image assaulted him, of the dark of deepest space, where half-seen creatures tittered and flapped. One of these creatures brushed Jones, and he shuddered at the feel of its skin, at once rubbery and leathery, and moist. Jones passed from this zone into a region lit by millions of nearby stars, at the center of which bubbled a crystalline monstrosity, whose color and shape morphed at random, and whose constant giggling made Jones cry out in his slumber. This monster was surrounded by dozens of the little morphs, who were extruding appendages that served them as pipes, and drums, and playing them in a manner that Jones had never heard of. The music knew no scale or beat, and used notes he didn’t believe existed, played in unknown modes. Jones moaned and thrashed as he beheld this tableau. Then the thing reached for him, and started to communicate without speaking, and something important shorted out in Jones’ brain, and he snapped awake, sweating and panting as if he’d just run a marathon. Jones groaned, and opened his eyes. The obnoxious piping and drumming was still echoing in his head, and the thought of the proportions of the buildings he had seen made his head ache. He signed off from the online service, and stumbled into the kitchen, where he sucked up four glasses of water before he felt satisfied. His skin was clammy, and cold, and his clothes were soaking wet. He shrugged off those garments on the way to the shower. After dousing himself with plenty of hot water, Jones felt a little more himself, though something was still tickling the back of his mind. The images of the nightmare were fading a little, mercifully, and he thought he might just get through the day. Jones hadn’t realized he’d fallen asleep while at the desk daydreaming. It had happened so suddenly. He remembered thinking about Christmas presents, and then he was shut behind the walls of sleep, in the throes of a nightmare. It was early evening now, and he was hungry. Casting a baleful eye at the little sculptures, for some reason not wanting to touch them, he grabbed his coat and went out to get some food. He walked out the front way because the smell coming from the dumpster was getting strong. There was enough of the odor lingering in his nostrils that his food tasted slightly of it, but he was so hungry that he wolfed the cheeseburger down anyway. He left the restaurant and crossed the street, entering the hardware store and purchasing a sack of lime, which he used to pour on the package in the dumpster, holding his nose while he did it. Even this didn’t keep his gorge from rising, and he lost the cheeseburger while doing this, almost choking as he was forced to move his hand from his nose in order to breathe. The lime did the trick, though, the package almost immediately starting to erode. Jones drank more water, and cleaned himself up, making a peanut butter sandwich to replace the other food. After a couple of sandwiches and some random potato chips, he felt somewhat better, and dozed off on the couch while watching a little tv. The dreams started again almost immediately. You are Jones. As soon as your head hits the pillow, your eyes close as if of their own accord. Instead of the usual pinwheels and fireworks of the eyelid movie show, what you see is nothing. Absolute darkness surrounds you, more dark than you’ve ever seen before. And something really stinks. It smells like fermented garbage dump, and it’s getting stronger. You get up and walk, hopefully away from the stench. It’s working, too, and the ground seems even, though it’s pitch dark still and you’ve no idea where you’re going. Suddenly afraid of falling into a pit, you stop. The stench has lessened a great deal, though you don’t think you’ve walked very far. It’s hard to tell, with nothing to establish perspective from. You try counting the seconds. When you get to five hundred a light appears, either very dim or very far away. Since as far as you know you’re standing on solid ground, and don’t know what’s ahead, you drop to all fours, tracing the route ahead with your hands as you crawl toward the light. Your sense of time is still screwed up, so you silently count the “steps” you make in this manner, but there are so many that you lose count. Your hands and knees begin to abrade as you travel, over what feels like gravel, on your way to the light. It doesn’t to be getting much closer, though you swear it is getting a little larger. You catch a whiff of something that reeks of the sea, and a breeze from your side. Suddenly the light winks out. You don’t panic, but back up a “pace” until you catch the breeze again. There’s the light, in the direction the breeze is coming from. You follow the scent of the sea, and the ground beneath begins to feel pebbly, rather than sharp and rough, and then sandy as you continue to move. The seabreeze is getting stronger, and cooler, and you can hear the faint sound of its rushing there ahead of you. And, even more faintly, what sounds like birds-gulls, maybe. Or laughter. It’s still dark, though, but the sea and the friendlier surface give you some renewed optimism. You can hear the lapping of the sea, although it is strangely muffled. Your fingertips encounter some dampness, and then more, wetter and wetter and wetter, until your right hand splashes into the water! You feel around in front and on the sides of you. All water. In back, there’s dry sand, at least for a little while, until you get the idea that you’re on a sandbar with the tide coming in, because your feet are getting soaked, and it doesn’t feel like there’s any dry land behind you any more, as you feel around with your toes. And the water feels thick, and it’s very cold. The breeze has begun to blow more strongly into your face, and droplets of saline water begin to pelt you, and the wind resistance is getting stronger. The droplets feel like buckshot, and stick for a moment before sliding off. Some of these drops fly into your open mouth on those occasions when you remember to breathe. The taste is indescribably bad, and you resolve to inhale through your nose only, but the taste remains at the back of your throat. Your hands, unbidden, grasp at something very like the sides of a shell, and you get the idea that you’re traveling on the back of something. And moving very rapidly toward the light. It is growing larger by the second, and acquiring a bluish tint. Soon a city comes into view, the source of the cold blue light. The unknown host slows, and smoothly draws to a complete stop without disturbing you. There’s now enough light to see by, and you disembark, jumping lightly up onto a wooden dock. Behind you there is a dull plash, and the host sinks out of sight before you can ascertain the nature of your conveyance. You walk along the pier and up a path that ascends the side of a large hill. The light is coming from the other side, and you move toward it, as quickly as you dare on the steep ascent. Occasionally, you have to use your hands to scrabble up the hill, especially as you near the summit. As you reach the top, the light becomes nearly blinding, until you look over at the city in the valley, all towers and winding medieval paths on top of walls, and gates guarded by men in strange armor, with devices in unknown languages, and odd little accoutrements like fanciful tails, and stylized wings. The helmets of these men are crested, and the masks are both elongated and protuberant. You stroll down the path toward the walled city, feeling no menace from these men. They are silent, and bear weapons of metal, swords and crossbows and ugly lances. You can hear them clank as they go about their rounds. You’re getting really close now, and pass what looks like a gatehouse unmolested. The men inside pay you no notice, even when you look in their direction. You continue on, drawn in one direction by a longing you cannot describe, on and on. You get a closer look at the guards, and perceive that they are not wearing armor,that the twisted, gnarled metallic shapes are in fact their substance, and you are informed that these are members of an unutterably ancient race, enslaved eons ago by the Great Old Ones, to guard the walls of the nameless city for the rest of time. A wash of sadness comes over you at the fate of these beings, and their mien and demeanor alter slightly, becoming somewhat fairer to look upon. The attractive features of the nameless city begin to manifest as well, and your breath catches in your throat as you behold obsidian towers and ebon minarets, with paths paved in lapis lazuli and onyx, embroidered with the finest silver and adorned with platinum filigree. While it is eerily beautiful, the size of the city begins to overwhelm you, and the absence of any color save black and silver and blue palls. You stop, and bide a while on a parapet, looking back toward the hills that you came over. At times you can discern shapes flitting around the peaks of those hills, black shapes with bat wings and long barbed tails. A sound comes from these hills as well, a tittering, high-pitched but audible, and echoing. You recognize these noises as the laughing bird-cries you heard before. You understand the nature of this place, once a mighty trading center, now deserted save the sentries, and shudder to yourself as some of the flitting batlike creatures draw nearer and you can see their featureless ebon faces, and hear ever more clearly their insane tittering, hee-hee-hee, as they swoop down upon you, and bear you away from from the city over the endless plains of the Cold Waste. You begin to comprehend just where this dream ends, and remember that you have read the books, back in high school and college, and desperately search the dustbins of your memory for the silver key that will bear you safely home from this voyage. You know that the journey has only started when you recall what happened to different dreamers in those stories, and pray to what gods remain to you that you don’t have to meet a ghoul, or especially meet a ghoul while it’s feeding. There is a sound coming from below, a soft meeping, and you shudder involuntarily as you recognize the sound as that of the very creatures you were hoping not to meet. There are hundreds below, encamped in a valley, where their luminous eyes are all that can be perceived as you ascend swiftly. It’s becoming colder, and the ground further away, and you spy an even larger and blacker city below. It takes quite some time before you fly over the city, and you whisper to yourself “Kadath, in the cold waste”, and still you fly on, clutched by the obscenely tittering night-gaunts. You recognize the feel of their leathery, rubbery, rough and slick skin, and realize what it was that brushed past you the previous night, and you enter the airless vacuum of space. And the understanding comes to you that your eyes are wide open, that this is not a dream, that you’re lightyears away from home, and are not even you any more. A glance at your limbs is enough to confirm this notion. Your arms are pliable, and end in bunches of tentacles, and you have no legs, only a congeries of muscles at the bottom of your bulbous cone-shaped body. Your eyes twist around to meet each other at the end of their stalks at the top of you, and you are just begining to fear. A collection of gigantic dogs with pelts of living fire streak past, and the stars are receding very rapidly indeed as the night-gaunts carry you through the depths of the ether, toward an unguessable destination. Your eyes have no lids, and cannot close as you rocket past exploding suns and long-dead worlds into the center of the universe, where stars have changed the laws of physics by their proximity, and light takes strange forms, and time is suspended, and matter doesn’t matter at all. The night-gaunts are no longer carrying you, you are being borne deeper and deeper into the mysterious envelope of the space between the stars until there is no space any longer, it is all star, and you are a sun, and still you journey, through the vastness toward the center, where sits a blind idiot god, enormous, dwarfing the largest of stars, surrounded by a swarm of sycophants, blowing mindlessly on extruded flutes, and playing restlessly on extruded drums, and dancing obscenely there in the center of it all, and you know that this is why you are, and what you must do. The idiot god has instructed you in the means of returning his brother god to his former domain, and that which is not dead will no longer lie dreaming. You are returned to your slumber bearing this terrible knowledge, and you have the will to resist, but the consequences are too terrible to contemplate as you wake and begin the preparations for the return of R’Lyeh to its former position and stature above the waves, and mouth the incantations that will foster the genesis of the son of Yog-Sothoth upon a living woman, who you have taken from the streets and secreted downstairs, rendered unconscious by a drop of a serum that arrives in the post. You are present as the form of the woman begins to alter into a vessel capable of bearing the child, and assist as she is loaded into your conveyance for the final voyage toward the sea. The father is to be present at the birth of his son, at the instant when the inconstant moon was nearer the earth than in times past, and showing her full face to the human race. The alignment of the stars has been favorable for some time, and will continue to be, but the influence of the moon cannot be discounted in this case. You in your terror labor to make this so, for the price is the obliteration of your soul, forever and ever, never to return. This is how you come to be driving the van-You labor mightily, taking no nourishment, not resting, until the woman and her unspeakable child are in the van and headed toward the ocean, flanked by a trio of shoggoths. It’s two days before Christmas, the moon is closer than it will be for centuries, and you want desperately for it all to stop, but you don’t know where to begin. The bargain no longer appeals to you, for it was entered into before you had full knowledge of what was to occur, and what was required, and you would give it all back to return to your small life among the ascended apes in the concrete canyons, but this can not be stopped. Not now. The moment is almost at hand, all of the players are in place, and the stage is set for the renascent Great Old Ones to reclaim this small but crucial ball of mud for their own. Jones drove on, ransacking his eroded memories for the key to his dilemma. The insistent piping of the shoggoths that guarded his once-human cargo had long since driven him mad. At least, insane by any normal frame of reference. To Jones, his reactions made perfect sense, in view of his environment and the factors that led up to the current situation. To his right was the black package, which he dimly recalled grabbing as the party left his home for the van. To his left lay the open expanse of the sea, which he had driven toward from Chicago, starting out two days ago. The sea was rougher than usual, the waves tipped with foam of the same luminous white-green as the shoggoths themselves. To Jones’ rear were the shoggoths, piping and drumming, and the body of what was once a woman, now merely the incubator of a child from beyond the stars, whose birth-cries would summon the cyclopean towers of lost R’Lyeh, the home of the dread Cthulhu, the octopoid god whose tiny figure he had received in the mail. The visions of the vistas he had beheld swam in front of Jones’ eyes, causing him to swerve and nearly lose control of the vehicle. The images returned to the back of his consciousness, where they continually spooled and ran. Amid those images was that of a carven star, of the same green material as the stone figures, with a black jewel in the very center of the star. This star-stone was of the same substance as the Elder Gods, and was charged by them with the power to send the Ones from Outside back from whence they came. Jones grinned crookedly at the thought of the star-stone, which he realized was the key he sought, and didn’t have possession of. Or did he? There had to be a reason why he had brought along the black package…so many alien thoughts had been running through his brain, and he was so tired, and felt so close to death that he didn’t recall everything he’d done and seen very clearly. But the image of the star-stone was very clear now, as if proximity were the hidden key to its influence. He hastily grabbed the black package with his right hand, steering with his left. Jones lifted the package to his face and began to gnaw at the scarlet ribbon. hanks and streamers of it wedged between his teeth, but he succeeded in getting the ribbon off. He tore at the wrapping in the same fashion, and worried the cardboard box the item was shipped in. Evil streams of mucus ran from his nose and mouth, dripping onto the seat and his mangy clothing, and onto the star-stone from his chin. For the package indeed carried the stone, with the black jewel in the center, and strange marks on each leg of the star. He turned the stone over, and over, and over, until the things written on it began to make sense to him. They were very near the shore now, off the road and driving down the rocks toward the water. Jones knew that they’d just keep on going when they reached the water, and still couldn’t quite get the words right. He glanced out the window, and the moon loomed, close enough to touch, it seemed. Jones stretched out his hand to touch it. The hand gripping the star-stone reached, and reached, and reached, and made contact with the agency that had sent the stone to him. The Elder Gods heard his cries, his desperate prayers, but couldn’t yet take action. Hoary Nodens stirred, waited. Jones stopped the van, the front bumper already in the water, and the drumming and piping stopped at the same time. The heartbeat of the soon-to-be born child could be clearly heard in the momentary silence. It got louder and louder, and the sky itself began to roil. The father had come. The clouds formed into a facsimile of his hideous visage, and the stars were blocked by the sheer immensity of his bulk. Drums began to sound from the other side as the moment of birth approached. The van was surrounded by hundreds upon hundreds of ravens and whippoorwills, clamoring and shrieking and swooping down, then up again, in a grotesque frenzy, waiting for the souls that they could catch. Offshore, the great city began to rise, slowly majestically. Jones could see the wave from this rising form and begin heading toward the shore, and saw the shoggoths clamber around the mighty towers and obtuse angles of the city of R’Lyeh, and that which is not dead started to awaken from its eternal sleep. The wave of the city’s rising grew larger still, and bore before it the odor that Jones had been smelling now and then, the stench of the Great Old Ones. The tips of its tentacles began to appear from apertures in the towers, and the drumming grew steadily louder, and the piping resumed. The sky cracked open, and the denizens of the other side made their way across the barrier. Cthulhu’s brethren began to chant his name, and a cry went up-Ia! The shoggoths pulled the mother and child from the van, into the water, and the son began to come forth. The immense eye of Cthulhu could now be seen as the city was entirely risen. His tentacles reached the shore now, just ahead of the massive wave that threatened to engulf all the land, and Yog-Sothoth’s terrible voice could be heard above the din and bedlam of the wilding skirling pipes and obscene pounding of gigantic drums. Jones moaned, and cried, averting his eyes, and praying to whatever gods would listen to take his soul, take him, please, and save the world from this monstrosity, stop this horrible process, and return things they way they were. He drew back his right arm and hurled the star-stone into the gigantic red eye of Cthulhu, where it disappeared into the gelatinous mass with a ploosh that was audible above even Yog-Sothoth’s voice, and the sky exploded into darkness, and the wave crashed, and then withdrew back from whence it had come, the city once again sinking beneath the waves, drawing all of the participants save Jones into the sea, back to the cold and unforgiving bosom of R’Lyeh, the crisis averted once again. The star-stone returned to the black package, its task fulfilled. Jones lay on the rocky beach, listening to the van’s motor run, until the mother sun came up, and the cries of seabirds roused him enough to get behind the wheel and drive back inland, toward home and the relative sanity of the holiday season. He passed the trappings of Christmas on his way, and was glad that there would be at least one more Christmas, and soon another new year, for the teeming masses that inhabited the globe he had just saved from an unimaginable fate. The Elder Gods are merciful, and no knowledge of those proceedings remained for the world at large. But the price Jones paid for his role was to always remember that moment when the planet was nearly torn asunder by the Great Old Ones, to whom time is nothing, and of his part in the proceedings. Jones also had the knowledge, the lore that he had gained through his travails, and knew just exactly how thin were the barriers between the mundane world of the everyday, and the terrors of the Great Old Ones. The Great Old Ones will wait for another opportunity to enslave the people of earth and the rest of the universe. They are older than this universe, and will outlive it, waiting in the cold and the dark for another chance…perhaps soon. There are always those who are willing to sell their souls for immortality, and don’t think twice about the consequences. All of these beings dream, and can be reached through those very dreams, molded and influenced, cajoled into doing the bidding of the awesome beings from Outside. Jones drove home, where he placed the terrible statues in a strongbox of oak, along with the package bearing the star-stone, and bore the strongbox up into the attic, mouthing a great many powerful charms over it. Destruction of the box was out of the question. Jones didn’t know that anyone else living knew how to prevent such an event from happening again, and he would possibly need those tools some time in the future. This done, Jones returned downstairs, where he glimpsed himself in the hall mirror, and shivered at the sight of himself. He cut quite a figure as Santa Claus, with his newly-white hair and beard, and enjoyed himself all the more with his awareness of the transience of it all. Posted Christmas Eve, 1999. I hope you enjoyed this little tale of a Christmas that almost wasn’t. Thanks for reading.